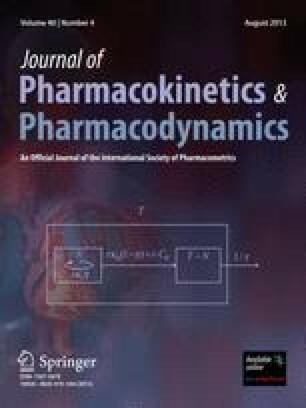 Nonlinear regression is widely used in pharmacokinetic and pharmacodynamic modeling by applying nonlinear ordinary least squares. Although the assumption of independent errors is frequently not fulfilled, this has received scant attention in the pharmacokinetic literature. As in linear regression, leaving correlation of errors out of account leads to an underestimation of the standard deviations of parameter estimates. On the other hand, the use of models that accommodate correlated errors requires more care and more computation. This paper describes a method to fit log-normal functions to individual response curves containing correlated errors by means of statistical software for time series. A sample computer program is given in which the SAS/ETS procedure MODEL is used. In particular, the problem of finding appropriate starting values for nonlinear iterative algorithms is considered. A linear weighted least squares approach for initial parameter estimation is developed. The adequacy of the method is investigated by means of Monte Carlo simulations. Furthermore, the statistical properties of nonlinear least squares with and without accommodating correlated errors are compared. Time action profiles of a long-acting insulin preparation injected subcutaneously in humans are analyzed to illustrate the usefulness of the method proposed. This work was supported by the Peter-Klöckner-Stiftung, Duisburg, Germany (grant to Professor M. Berger).